I have 2 geese on my porch and have purchased many outfits from Miles Kimball. 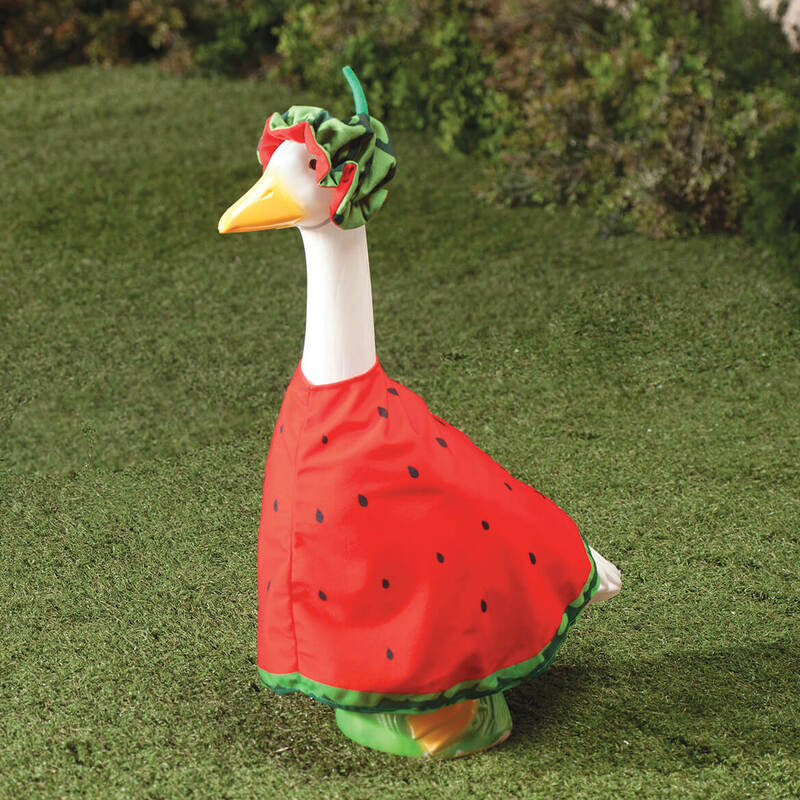 Since it was such a hot summer, my geese looked very cool and cute in the watermelon outfits. Since the place where they live is unprotected, this outfit did not fade and looked as pristine as when I dressed the geese in July (took them off on Nov. 20). I switched to the boy/girl pilgrim outfits. Keep new cute outfits coming! The outfit is very nice but the hat does not have ties so with the elastic in it, it falls right off. I added string to tie under the goose's neck but will add a nicer bow later on. For fun, like dressing my goose in something new every month. Its a great spring summer outfit! I chose this item for the up coming Fourth of July holiday dress. Perfect for summer time dressing my geese. Cordele, Georgia is the Watermelon Capital of the World !! I live there and want to promote our products ! My goose Daisy will be the envy of all other geese in my neighborhood. I have lots of outfits for my goose and thought this would be a good addition to its wardrobe. It was unique. Looked fun. Cute summer dress & has a hat. Love the goose outfits. Have purchased several already. Want one to change for each month of the year. Would be nice to find a patriotic one for July. Thanks. Our neighbor puts these geese out every holiday and it spreads a little joy to all that see them ~ we wanted to join in. It is a cute summer choice. I needed a new outfit for my goose. My mom used to make them for me. She has since passed. I have put off ordering. So this is my first time ordering one. If I like it I will be buying more. I like to dress my goose for all holidays. Right now I'm choosing this one for the summer. I dress up my oxygen tank with these outfits. Lots of fun!!!! Just adorable. But the one thing I would like to recommend is that you have some kind of little matching "hats" for a "baby" goose. My "mother" goose has a "baby" goose next to her. A friend of mine gave it to me to compliment the "mother" goose. The "baby" goose came with matching "hats" that the "mother" goose wears. this outfit would be cute for summer time. These items fit my outdoor goose well and are very well made. 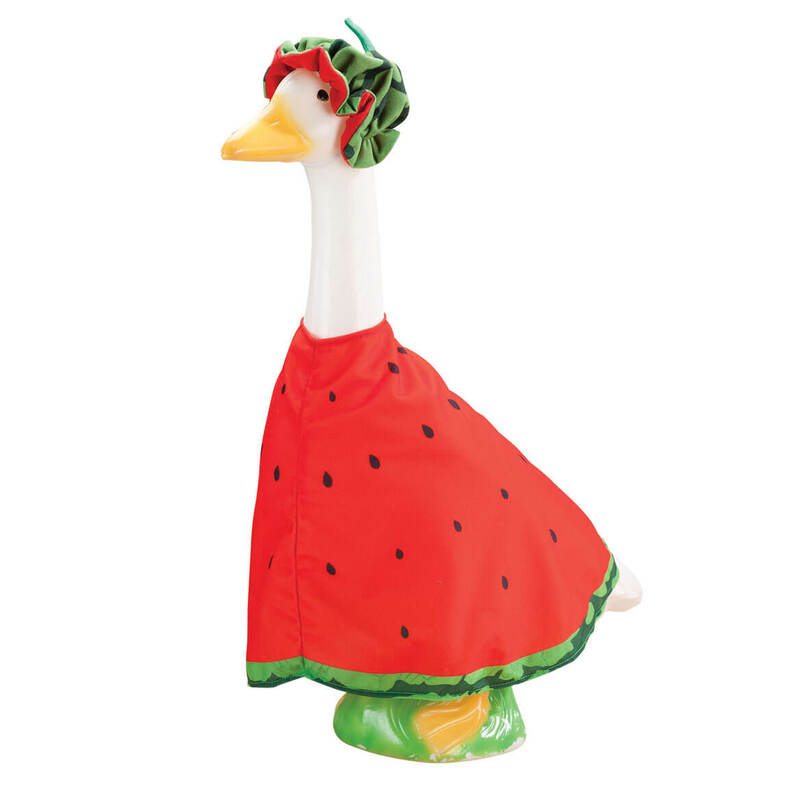 Will this Watermelon Outfit fit the large goose or is it for the small goose? BEST ANSWER: Thank you for your question. 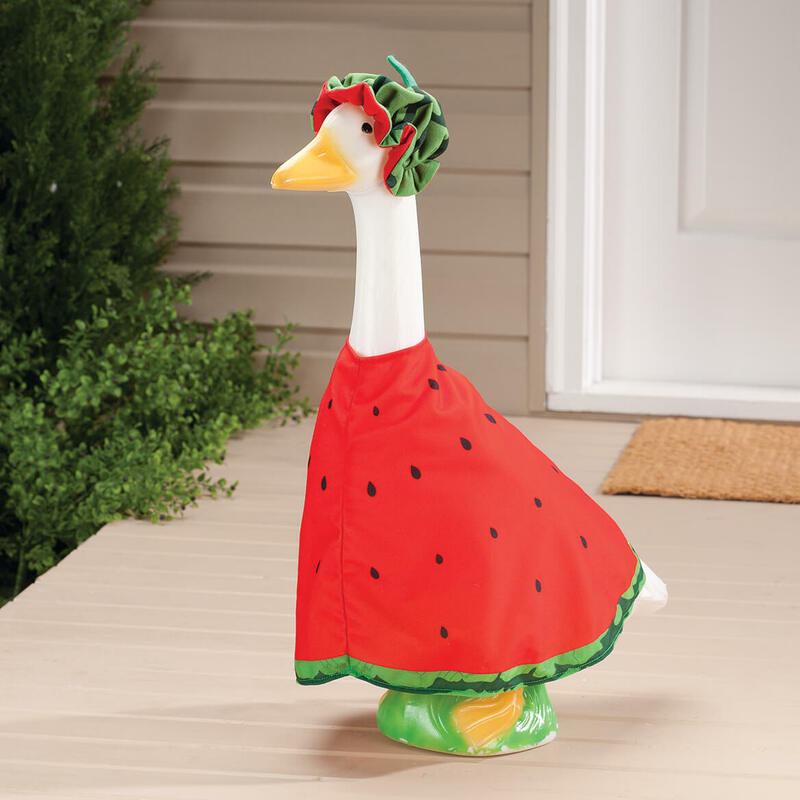 The Watermelon outfit is for the large goose. We hope this information will be of help to you.